Like the poet I love pretty words whether they be docile, smooth, tender, bright, lazy or gilded. I have always been fascinated by the ability of a word to convey a million different emotions. Shakespeare is the master at this. In 6 short words you understand the delicate state of Hamlet’s soul (“to be or not to be?”) and in just 3 we grasp the mad desperation of Lady Macbeth (“Out damn spot!”). I’ve often wished that I had a real, genuine pen pal whom I could write long gushy letters to. I just finished a book about the women of the American Revolution called Founding Mothers by Cokie Roberts. One of the things that amazed me was all of the letters these women wrote- sometimes to men and women that they would never or rarely meet. It is remarkable how much we learn about the daily goings on and the various opinions of the female correspondents. I was constantly caught off guard with how modern and ambitious these 18th century women felt and behaved. Some might argue that letters have been adequately replaced by email, blogging, facebook, twitter etc. While these conveniences have their place and appeal they are not as thoughtful or thought-provoking merely because they are so easily produced. A letter took real effort. An email- not so much. Nowadays kids don’t even spell entire words out when writing to each other- let alone actually putting together a real letter with powerful ideas from the heart. For years I have started my diary entries as “Dear Friend” and then I write as if I was filling in a dear friend on the thoughts of my heart and the goings-on of my life. While sorely missing the response, at least this allows me to format my ideas in the ways of old- something I find valuable in many ways. Next time you have family home evening or a free moment sit down and write a traditional letter. You can mail it or not but it will probably surprise you how interesting your life and thoughts are These lettter’s do not have to be profound or sad, you may be fascinated by how witty you can be. Give it a try! 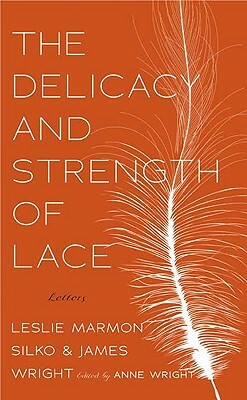 If you want to read a great little book about a glorious correspondence check out The Delicacy and Strength of Lace by Leslie Marmon Silko and James Wright. It is a small book but one of my top 10 favorites (and it is recently back in print!). It is the real life correspondence of Wright and Silko- 2 poets who only met briefly but exchanged letters for years. I have like 3 copies if anybody wants to borrow.